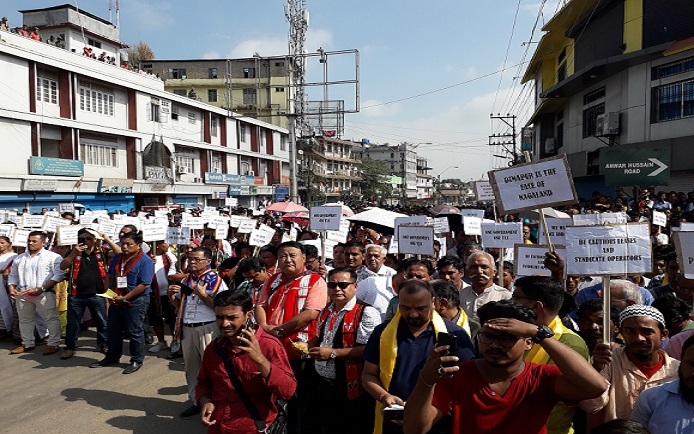 The Public Action Committee of Naga Council Dimapur held a public rally demanding an immediate stop to all forms of “illegal tax collection” by Naga political groups as well government agencies, various unions and organisations in and around Dimapur district. The Public Action Committee (PAC) of Naga Council Dimapur held a public rally at Khermahal junction here on Wednesday demanding an immediate stop to all forms of “illegal tax collection” by Naga political groups as well government agencies, various unions and organisations in and around Dimapur district. Exactly five years back, a similar rally was organized by anti-graft group – Against Corruption and Unabated Taxation (ACAUT), Nagaland at City Tower junction here on October 31, 2013 to make a similar demand. However, the rally on Wednesday drew much fewer people than the ACAUT rally in 2013 with around 5000 people, both Nagas and non-Nagas, attending it. The speaker at the rally said the PAC was compelled to take out the rally as illegal taxation in Dimapur has become an “industry” for the Nagas including the Naga political groups, various government agencies, unions and organizations, even though rampant collection of taxes came down considerably for two to three years after the ACAUT rally. Bowing to ACAUT’s demand, the state government constituted a three-member fact-finding team headed by retired Supreme Court judge Justice H K Sema. The speakers expressed dismay that the government is yet to take any action on the report submitted by the team three years ago. Speaking at the rally, PAC convenor Vekhasayi Nyekha, Naga Council Dimapur president T Bangerloba Ao, member of PAC fact-finding committee on illegal taxation Hekehvi Achumi, Naga Women Hoho Dimapur president Sungsabeni Jamio Central Naga Tribal Council advisor Pius Lotha, Angami Public Organisation advisor Savi Liegise and a senior leader of Eastern Naga Public Organisation W Lemba Chang expressed deep anguish over rampant illegal tax collection in Dimapur district. At the rally, the committee adopted an eight-point resolution and demanded that the Nagaland government must immediately stop all illegal taxation and rampant collections on various goods and services, transporters, entry fees on vehicles, item wise tax on goods, dealers, stockiest and retailers. The state government must take immediate step to check and ban syndicate and lease system, unauthorised collection centres operating in and around Dimapur district by various unions and organizations, including Naga political groups and state government agencies resulting in uncontrolled inflation in all prices, the committee stated. As per the resolutions, the Naga general public reaffirmed their stand on “One Government One Tax” as resolved on October 31, 2013 rally. They also strongly resolved to stand united irrespective of tribe, community and social position against the menace of illegal collection of tax which has crippled and threatened the very survival of the citizens. The rally resolved to empower the PAC of Naga Council Dimapur to pursue the resolutions In letter and spirit.